Choose from a selection of 87 holiday rentals in Rijeka. Use the search form to the left to filter the results and pick your choice of self catering accommodation in Rijeka. We have a good selection of holiday apartments in Rijeka perfect for family, single, romantic and group holidays. You may prefer to take a look at our listed holiday villas in Rijeka or holiday apartments in Rijeka. Find your holiday homes by a specific type using the property type drop down in the filter. Filter the holiday homes in Rijeka by a specific area using the area list above. In the quieter part of Rijeka, these two cozy holiday apartments are located CKO867 and CKO868. Both are located on the ground floor and each has its own terrace. This beautiful holiday home is located in Srdoci, on the outskirts of Rijeka. On the first floor of a new building is this modern holiday apartment. It has one bedroom, a living room with a kitchen, a bathroom and a large covered terrace. Located in the center of Rijeka, this spacious and comfortable apartment will provide a nice stay. Shops, cultural events, museums, restaurants, etc. are reachable within ten minutes. In old villa this charming and spacious apartment is situated. It is located in the suburb of Rijeka in natural surroundings where you can will spend peaceful and calm vacation. This lovely holiday apartment is located on the 17th floor of a skyscraper and will delight you with its breathtaking views of the sea. This elegant holiday apartment is a little bit over hundred meters from the beach away. It has two bedrooms, bathroom and living room with kitchen. From this typically furnished apartment CKO330, you can enjoy a lovely view of the sea and Opatija. The apartment CKO443 has only partial sea view. This comfortable holiday home allows you a pleasant and relaxing holiday. 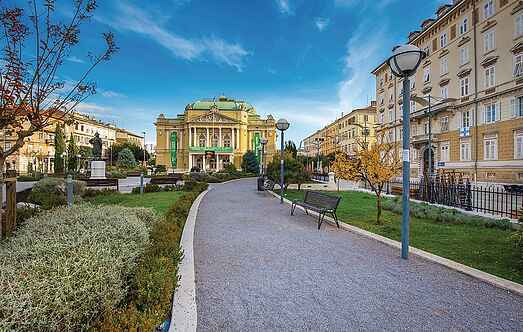 It is situated in a quieter part of Rijeka, not far away from Opatija.